Republicans long ago identified the qualities required of a presidential candidate who could pose a legitimate challenge to President Barack Obama. The list of attributes was short. Above all else, that candidate must exude an adult-in-the-room savvy regarding stabilizing federal spending and growing the economy and be able to express that competence to the American people. The method to accomplish that goal, in the view of conservative Republicans, would be to reform tax policy, control federal spending and set the nation's finances on a path away from the fast-approaching chaos of unparalleled federal debt. Rightly, we think, they concluded that all else pales beyond enacting necessary reforms, including limiting the reach of the federal leviathan, that would help unleash American productivity and create jobs. Not only is the former governor of Massachusetts, Mitt Romney, best prepared, according to those criteria, of all the remaining GOP presidential hopefuls. He is also among the most skilled job-creating candidates for chief executive we can imagine. The Arizona Republic recommends that, in Tuesday's primary election, Republican voters support Mitt Romney for president. 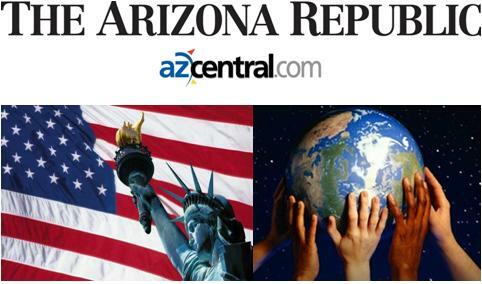 It's nice for Mitt to receive the Arizona Republic's endorsement. However, since it is a lib paper, I'm not planning on them giving him much support in the upcoming election. It's generous of them to condescend to suggest voting for Mitt in the primaries. In the general election, Mitt will be the demon and Barack Obama will be the poor picked on black man who needs another 4 years of flying around in Air Force 1 and apologizing to foreign leaders on the taxpayer's dime. but won't this endorsement at least limit somewhat their critique of romney in the general election. won't their credibility suffer if they wholly contradict that romney is an adult when talking about the economy and romney's record of job-creation? I never count on liberals being unbiased or using logic. That way, I'm never disappointed! LOL!